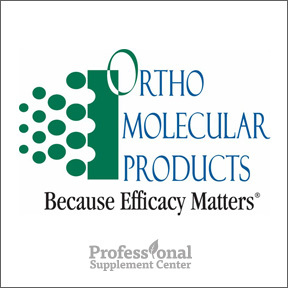 For over 25 years Ortho Molecular has been developing and manufacturing their own functionally superior formulas with a goal of achieving greater efficacy to ensure their products noticeably enhance wellness. Ortho Molecular is well aware of the vast array of choices when it comes to supplementation. While Ortho Molecular meets or exceeds every federal requirement for manufacturing standards, their selection of the best quality raw ingredients, focusing on potency, freshness and overall quality, sets them apart. To this end, Ortho Molecular’s evidence-based formulations are designed with well-researched and superior raw ingredients. All products undergo extensive in-house testing and are developed, manufactured, bottled and labeled in their own state-of-the-art cGMP, FDA-audited facility, ensuring the purity, strength, identity, composition and safety of every formula. Extensive testing makes certain that every product can be trusted to include the correct therapeutic dosing of each ingredient based on established research. Adren-All – This unique blend of key targeted micronutrients, adaptogenic botanicals and adrenal concentrate is specially formulated to strengthen the body’s stress response and support healthy energy levels. This powerful formulation aids in maintaining balanced cortisol and DHEA levels to promote improved mental and physical performance. Gluten, soy and dairy free formulation. Cerenity – This comprehensive formula is designed to address daily stress by increasing production of the calming neurotransmitters serotonin and GABA. Key ingredients support improved concentration and a relaxed and effortless state of awareness. Gluten free. Cerenity PM – This synergistic formulation promotes a healthy sleep cycle by naturally boosting the levels of sleep regulating hormones and neurotransmitters with bioactive cofactors and amino acids. Specific ingredients promote calmness and relaxation and support normal, uninterrupted restorative sleep. Gluten free. Mitocore Protein Blend– This easy to digest and scientifically formulated brown rice protein blend is designed to boost mitochondrial reserves and jump-start cellular energy production. The formula includes key micronutrients and phytonutrients to optimize daily nutritional intake, increase antioxidant protection, support immune function, protect the mitochondria and continually recharge the energy production cycle. Gluten, soy and dairy free. CereVive – Designed to support mood and brighten mental outlook, CereVive is formulated to improve stress resilience and promote a relaxed, focus state. This formula includes targeted vitamins and minerals, amino acid precursors and bioactive nutrients that support healthy levels of neurotransmitters. Perfect for mid-afternoon doldrums, restlessness or the inability to adequately focus. Gluten, soy and dairy free formulation.